Summary: A dumbbell set is perfect for home workouts, the strength training ideal for reducing body fat, burning calories and increasing muscle mass. 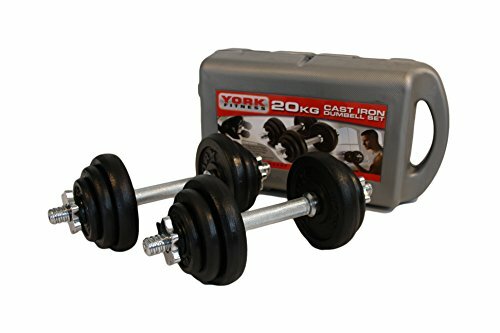 The York Fitness dumbbell set is reasonable in price, offers a great variety of weights and is built to last – while is easily stored in the handy plastic carry case. To say this is a popular choice would be an understatement, at the time of writing more than 700 people have left reviews at amazon.co.uk – largely very positive. Check out the product page now and see how this item rated. The York Fitness Dumbbell Set offers users a compact solution for your strength training workout kit. The set includes two bars and twelve different weights to ensure that the training is targeted to individual users and that progression is easily achieved. The low cost set also includes four spinlock collars, which make it easy to increase or decrease the weights. The set starts with the two 14 inch chrome spinlock bars, these designed for durability and strength. There are 12 weight discs in total. Four of the discs have a weight of 0.5 kg, four weigh 1.25kg and the remaining four have a weight of 2.5 kg. These are joined by the four spinlock collars, designed with an anti-slip rubber edge. The set comes complete with a full colour exercise wallchart. The whole set comes with a plastic carry case, making it great for taking anywhere. The case is small too, so you’ll have no worries when it comes to storage. In terms of cost this York Fitness equipment is reasonably priced in comparison to similar equipment, especially when you take into account the small price reduction offered by Amazon. There is no doubt that users are highly satisfied with the dumbbell set, hundreds of buyers awarding it the maximum five stars, with an average rating well in excess of four stars. Users agree that the equipment is reasonably priced while also praising the nice variety in weights offered by the set. The small size of the weights has also been praised, making them easy to handle and ideal for a wide range of exercises. The only small criticism by some users is the roughness of the bars, although other users have stated that is a necessity, so simply wear gloves when working out. The York Fitness Dumbbell set is perfect for your home workouts. The plastic carry case makes transporting and storing the equipment no hassle, while the good range of weights means you’ll be performing each rep optimally. High on value too, so check it out for yourself at Amazon.co.uk!